I have a confession to make. At that particular stage, I was 100%, through-and-through, one of those awful irritable passengers that saw a family travelling with anyone under the age of 12 as a threat to my in-flight serenity. Heaven forbid your child (a) sits behind me and kicks my seat mercilessly and/or seems to constantly have his/her tiny little hands rummaging through the back pocket; (b) makes a single noise that disturbs my in-flight entertainment zen, or worse, screams and is inconsolable (“are you going to do something?! Kids don’t cry for no reason, you know!“); or (c) generally does not behave. Like an adult, that is. Because that’s what cranky passengers like ex-me seem to expect. Of course, karma was absolutely waiting to jump on the chance to teach me my lesson. Now, Tuna is actually a pretty good flyer on the whole. I flew solo with her a lot from when she was about two months old, up until around 9/10 months old. Her first ever flight was eerily, strangely, too easy. I nursed her, she fell asleep, I put her in the bassinet, and she continued to sleep for the entire duration of the 7-hour flight. If you refer to this earlier post, you will of course know that I gleefully counted every minute of that 7 hours and failed to get any sleep myself. But that’s fine. My first flight with a baby was a success. Subsequent flights followed a very similar course, but with shorter stretches of time spent in the bassinet, and longer stretches of a 10kg 6-month-old being strapped to me in the baby carrier, whether standing and pacing (more like bobbing) around the plane or sitting with her sleeping on me while I tried to eat my meal with two free hands, which is a phenomenon that most mothers have forgotten exists. The last flight we did alone was a 14-hour direct flight from Singapore to London when Tuna was about 9 months old. It was a day time flight. She slept for 45 minutes. You get the picture. Or if you don’t, well, it’s all kind of a blur because I genuinely don’t know how we made it. So, Mama and Tuna went on another overseas adventure – alone – on Tuesday. A is travelling a lot for work over the next couple of weeks so I figured I’d go to the land where babysitters are plentiful, homes are cleaned and meals are prepared through no effort of my own – hello grandparents. I did think twice about whether my burgeoning belly, wriggly climby toddler and I would be able to cope with the journey to this promised land. But my parents and Tuna’s doting aunt and uncle convinced me to just do it. And so I did. This most recent journey has taught me even more about the intricacies of travelling with a small human. I feel a list coming on – don’t you?! Travel tips, here we go. Or rather, my take on the usual tips you see when you Google “how to survive a flight with a baby/toddler”. Your empty plastic cup: at least 10 minutes. Add on another 8 minutes if you let your child pretend she’s giving you a “baff” (bath) with the residual drink droplets. For that reason, I recommend you stick with water as your beverage of choice for the entire flight, otherwise things will get sticky. The seat belt: 20 minutes minimum. This falls into the pseudo-independent play category though, because you will be required to unbuckle the seat belt every time your little one triumphantly fastens it. I did wonder for a minute whether I should just teach her how to do it herself but figured I’d regret that later. The remote control: 25 minutes. I know. That’s almost half an hour, people. In adult time, that’s like eight hours straight. I should warn you though, that if you really want this beautiful stretch of having a content and mostly quiet baby, you will have to hope that the person sitting in front of you is super laid-back and loves getting a mini-Shiatsu-head-massage thanks to your darling repeatedly putting the remote into the cradle and pulling it out again. But you know what, I’ve had other adults sitting behind me in a flight who treat those things like their personal in flight punching bags, so you do your thing, Tuna. 2. Ensure you have plenty of healthy, nutritious and conveniently packaged snacks on hand. Well…yes. But what this commonly-referred-to tip always fails to mention is that this goes hand in hand with the acceptance that your chances of having stain-free clothing at the end of your journey are reduced to almost nil. Allow me to elaborate. Conveniently packaged? Read: squeezie packs and/or boxes of raisins. And while, God help me, I love those organic, no-preservative, super-power-inducing, little foil packs when I’m in a fix – they lull you into a cruel, cruel false sense of security. Yes, they’re wonderful because your child can feed themselves. But they’re horrible in the sense that even an 18-month-old’s lightest grip on the packet will propel a fountain of apple-blueberry-quinoa mush that must always squarely land on your shirt. Raisins? I don’t need to spell this one out. Any caregiver that resorts to these as a “conveniently packaged” snack can name for me, right now, eight different surprising places where raisins were subsequently found, either on your person, or off. The other leg of this tip is that you should also make sure you have some food packed for yourself. Chances are that when they come around with the meals and ask you whether you’d like chicken or fish, you will be in the midst of a poo explosion, tantrum, or any other fun activity your child decides to engage you with at a high altitude and cramped space. 3. 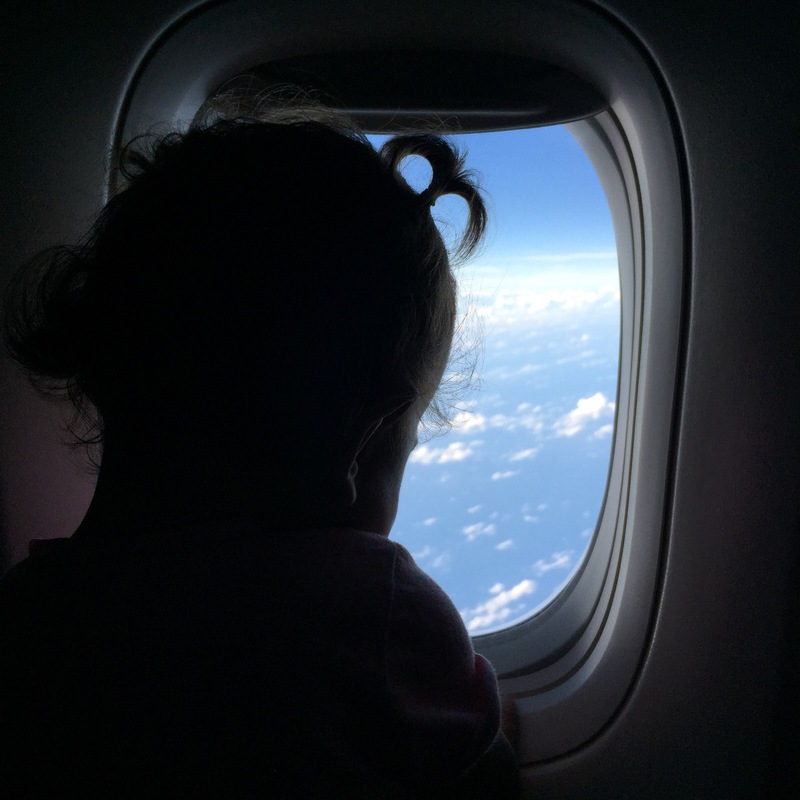 Try to get a nighttime flight, so that you and your little darling can both get the blissful night’s rest that you need prior to reaching your exciting destination. This is the biggest lie of them all, folks. I had an epiphany on this trip. Day time flights are the way to do it. Especially if your child is cut from the same cloth as mine. Traditionally, I’ve almost always strictly heeded with this mythical advice, because to the rational mind, it makes sense, right? We’re all wired to sleep at night – so guys, get a flight that’s just slightly after your toddler’s bedtime, they’ll be out like a light and you can squeeze in a movie and then go off to la-la-land yourself. You will all feel refreshed and energised at the end of your peaceful flight. Here’s the problem: it is precisely when you have the expectation of sleep that sleep will not happen. I’ve been on several overnight flights with Tuna where she’s exhausted, but is waking up on the hour (if we’re lucky), I’m exhausted because it’s 1am at home, but neither of us is able to get a proper stretch of sleep. Maybe it’s the genius location of the airplane toilets and that terrifying whoosh of the flush combined with clumsy door-openers and their related door slamming sounds; maybe it’s that really helpful flight attendant with the loud, perky voice asking you whether you’d like some orange juice at the equivalent of 3am at home; maybe (or in our case, definitely, *every*single*time*) it’s the fact that your child and the child in the bassinet next to it are playing a game of wake-up-and-scream-tag, so that the minute your baby is all bundled up in that little sardine can of a bed, the other kid lets out a shrill scream which wastes all of the bobbing you’ve done for the preceding 45 minutes. Talk about stressful. Now, with a day time flight – are you expecting much sleep? Not really. I was expecting a nap or two, but knew that most of the flight would be a one on one play date with my daughter. That’s the winning ticket right there. Expectation. You’re not expecting much sleep, so any sleep you or your baby gets is a bonus. It’s a little gift from up above, that you simply were not counting on, and will delightedly accept. Contrast this with the stress that comes with “but it’s 2am at home right now! WHY are you still awake? !” Instead – you look at other passengers, especially those with awake children, with an annoyingly smug expression that says “she sleeps easily like this all the time; gosh I must be really good at this”. The other winning ticket: it’s day time for you, so you’re wired to be *awake*. You can have a coffee beforehand and know what you’re coming up against, and your biology isn’t telling you that you really need to shut down. Finally: other passengers are also mostly wired to be awake at that time. So you’re not anxiously worrying about who you’re going to wake up. Come on, buddy! It’s three in the afternoon! You’re a grown man – do you really need that nap? Safe to say – I’m now a day time flight convert. 4. Enlist the help of the kind, helpful flight attendants so that you can take care of your needs, mama. Read: distract the baby with an activity (re-read tip #1). Whisper to the flight attendant that you need to pee because your in-utero child has decided that your bladder is her personal trampoline. Promise you’ll only be a minute. Run. Run to the bathroom. Hear your child have a meltdown because she suddenly realises your presence has been replaced by that of a well-groomed, smiling woman with the world’s most perfect bun. Continue doing what you need to do. This becomes increasingly stressful if you’re like me and have publictoiletophobia, and will do whatever it takes to avoid touching anything with your hands – such that everything is handled with a paper towel and your elbows, and elbows are only if it’s absolutely necessary. On that note – I commend Singapore Airlines for their recent toilet waste-bin design which now has…*drumroll* A FOOT PEDAL. No more pushing your used paper towel down that flappy rubbish bin lid and trying to rip your hand away as quickly as possible so that you don’t get it stuck in the overly springy lid, or worse, have to touch anything. Okay. I’m getting distracted. Run back to your child. Thank perfect bun lady and apologise for having potentially put her off motherhood. Done. 5. Exercise proper in-flight etiquette by ensuring your child is quiet, sits still and does not disturb other passengers. A well-planned sensory activity should do just that! Hahahahaha. Just kidding.